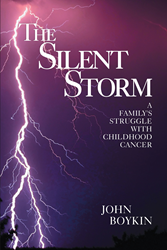 Recent release “The Silent Storm” from Page Publishing author John Boykin is a heartrending narrative of the devastating diagnosis of cancer to a family’s beloved daughter and how this brought a life-altering impact to all of them. John Boykin, a retired deputy sheriff and a loving father, has completed his new book “The Silent Storm”: a gripping true account of the author and his family’s journey with caring for a cancer-stricken daughter and continuing to attend to her needs throughout the years. Published by New York City-based Page Publishing, John Boykin’s touching tale portrays a real-life event that began with the shock of hearing the doctor’s diagnosis to spending all that there is for a loved one’s medication and finally receiving the good news of remission. Readers who wish to experience this emotionally charged work can purchase“The Silent Storm” at bookstores everywhere, or online at the Apple iTunes store, Amazon, Google Play, or Barnes and Noble.